The Goldrush, constructed on the historic British Columbia Goldrush route, is a spacious and homey 2,280 square foot, post and beam log home. 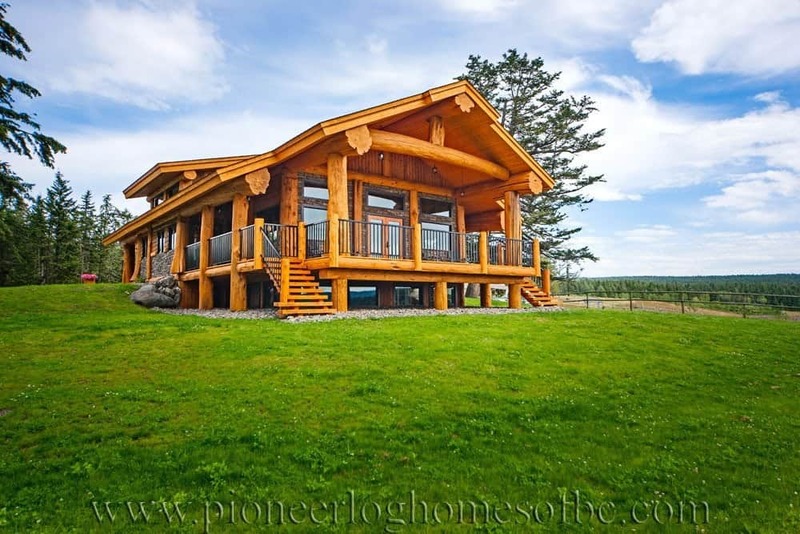 This rancher style log home is a perfect single family dwelling, ideal for home bodies or those who love to entertain. If you’re concerned one floor may not be enough space, add a full or half basement to accommodate your specific needs. The Goldrush houses three bedrooms on the main floor. Two spacious bedrooms, which occupy the space at one end of the home, are perfect for children or guests. Additionally, these rooms could be converted to a hobby space. The large master bedroom is an absolute dream come true! Designed for a 9X9 walk in closet and large ensuite, this room will provide the ultimate relaxation space. Don’t need a large closet? Work with our design team to re-purpose the space to fit your needs! The remainder of the home includes a small laundry room, a large open concept kitchen and dinning room and a multipurpose great room. If you don’t need a basement, the kitchen or master bedroom can be expanded for even more space. As designed, the kitchen houses a bar height island and ample counter space complete with a pantry – these all are options that can be modified for your family’s specific desires. The large great room houses a fireplace, creating a perfect area for visiting and entertaining. The nearly 20×27 space leaves enough room for a television area, a games area, a piano, or whatever makes you feel at home! Last, but not least, is a large deck that extends from the front of the home, off of the great room. This is the perfect place to enjoy a beautiful view, have your morning coffee, enjoy a barbecue with friends and family or take in the sunset with your spouse! Just like you and yours, each Pioneer home is unique! Our design team delights in working with you to create your personalized floor plan. If you’re interested in the Goldrush, or any elements of this design, contact our team today!